The idea behind Big Rig Dance Collective (BRDC) sprung up in 2010 on a road trip from Denton to a performance in Austin, TX. Like highways connect cities, we aim to connect diverse communities through performances, community classes, and collaborative events. In our creative process, we value what each individual brings to the group, and that is often the impetus for our work. Whether our collaborations lead us to light-hearted theatrical movement or raw energy and explosive physicality, we always start making dance by looking to what drives us in the here and now. Our methods for creating often include improvisation, choreography, and collaborations with other artists. 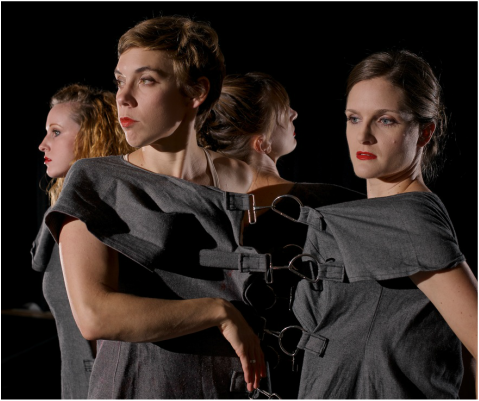 BRDC is directed by Crysta Caulkins-Clouse, Whitney Geldon, Amanda Jackson, and Lily Sloan and creatively developed with many DFW area dance artists. See Director Bios and Collaborators for more information. I find the Big Rig Dance performances very challenging to the soul - thought provoking, disturbing, moving... not for the faint of heart. You encourage people to think. © Big Rig Dance Collective LLC. Photo by Jesse Scroggins.